Discussion in 'Apple iOS' started by II WaStEdPrO II, Jun 18, 2009 with 13 replies and 676 views. 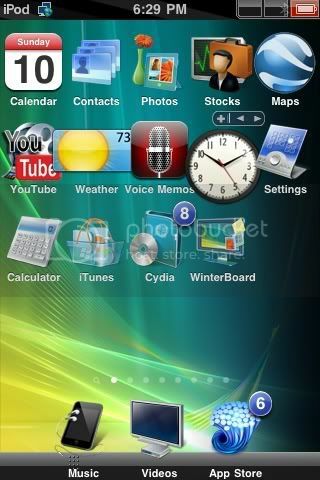 5.Type in "Five-Column SpringBoard" and Download. 8.Type in "Five Icon Dock"
How do i get the default Apps icons? How To: Change VOIP icon to iPhone icone! Ohh..thanks. I didnt even notice that. nice dude, just finished looks good. Cool, but i think that if you have 3.0 firmware and you download the 5-Column Springboard, you might have to DFU restore. I think thats how it goes down but im not to sure. cool. ima do this later, is it crammed or? Doesn't cram too bad if you get a theme that shrinks the icon sizes. Also, you should just turn off app names in Winterboard. Can someone post a pic of what it looks like?